Email Carmen Chambers at carmen@tmwholding.com. ISO PCA’s/CNA’s and RN’s. 3+ years experience required. **Apply today** GentleCarePeeDee@gmail.com. 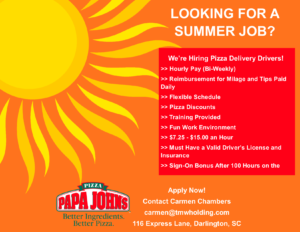 Job offers a competitive benefits package. The job requires that you have a high school diploma, experience with computers (MS Word and MS Excel a plus). Must be punctual and be able to learn from instructions. Should also be familiar with three phase power systems. Must have reliable transportation. One year of maintenance experience or technical education a plus. 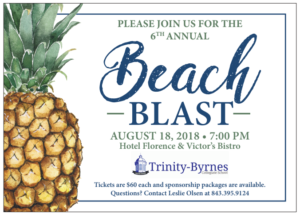 Trinity-Byrnes is hosting their 6th annual Beach Blast on August 18, 2018 at Hotel Florence. 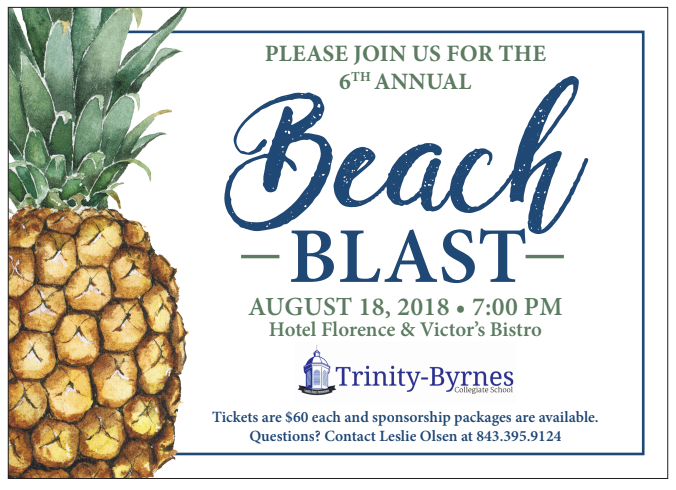 For more information contact Leslie Olsen at 843-395-9124. 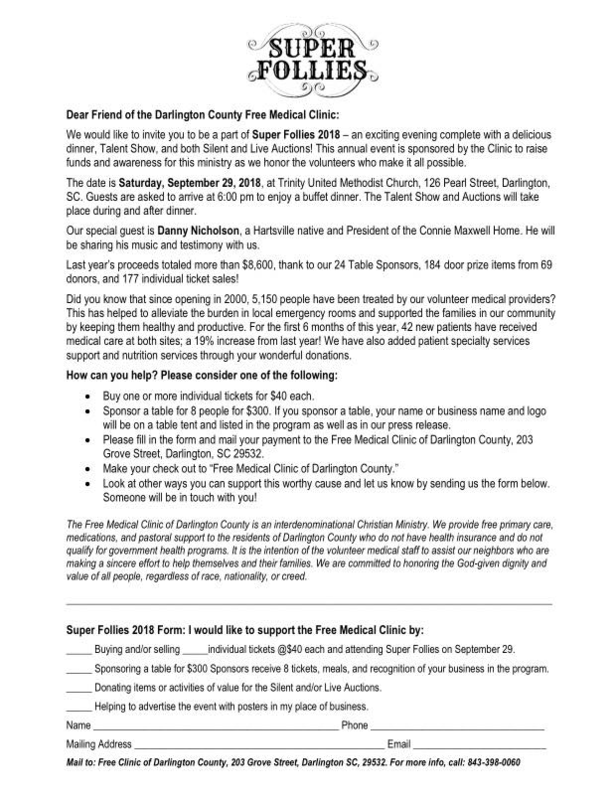 Sponsorship opportunities and tickets are available! 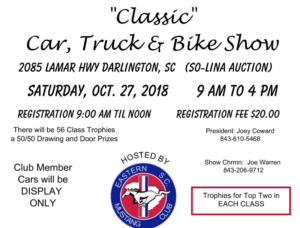 Do you live in South Carolina and want a good deal on Bojangles Southern 500 tickets? 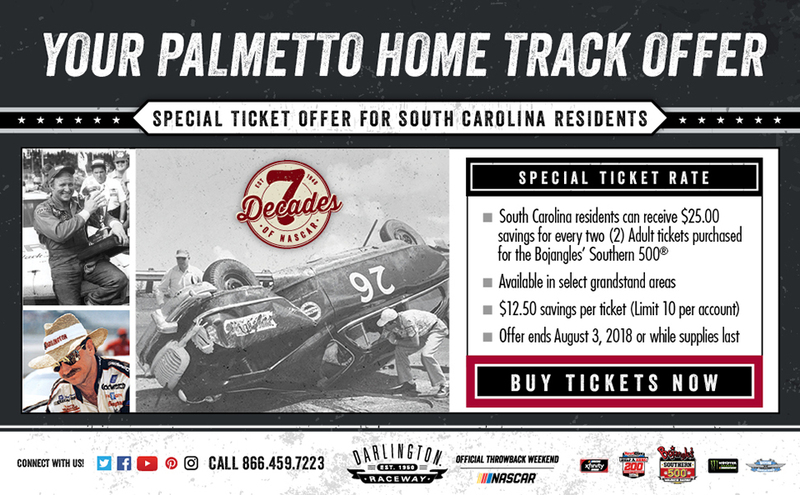 Check out the Palmetto Home Track Offer! 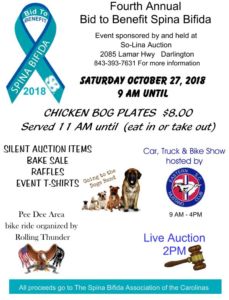 The 4th annual Bid to Benefit Spina Bifida is hosted by So Lina Auction on October 27. 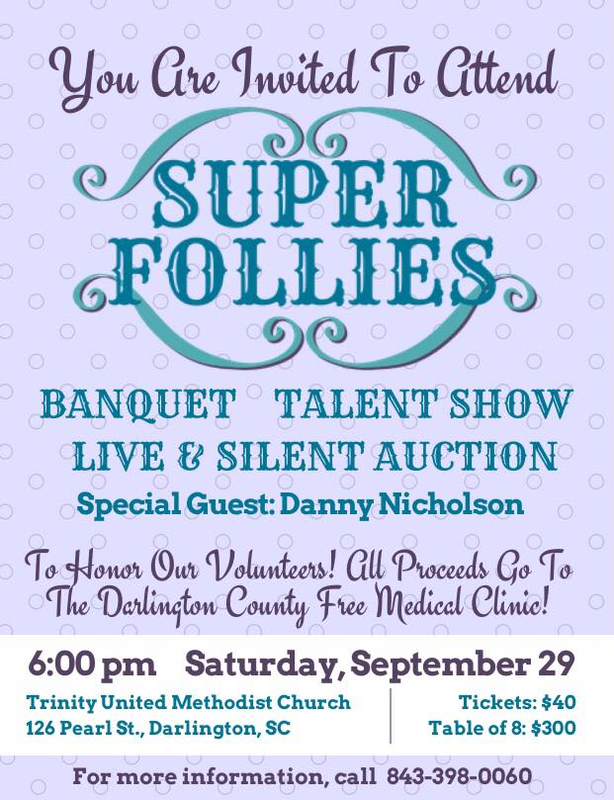 Don’t miss this great event for a great cause! 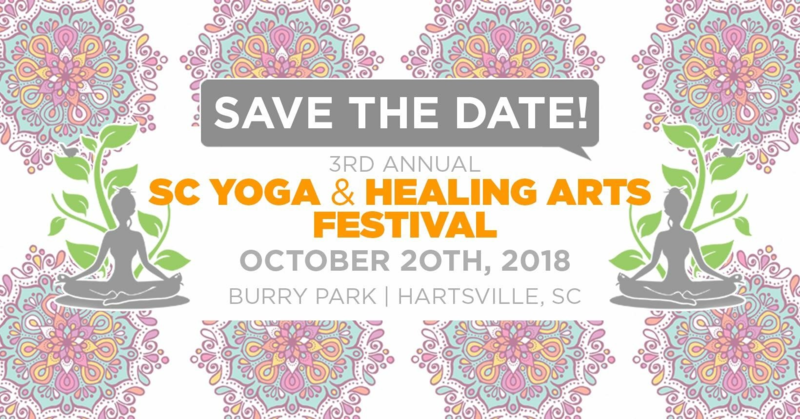 Save the date for the 3rd Annual SC Yoga and Healing Arts Festival on October 20th! 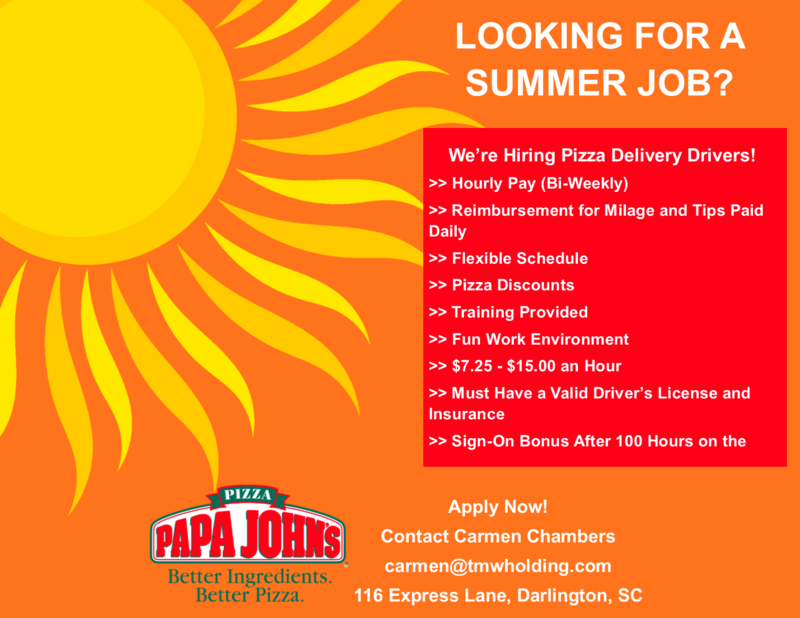 The Darlington County Recreation Department has so much going on this summer! 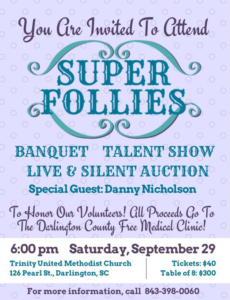 You’re invited to attend Super Follies- a banquet, talent show, and live & silent auction to benefit the Darlington County Free Medical Clinic. 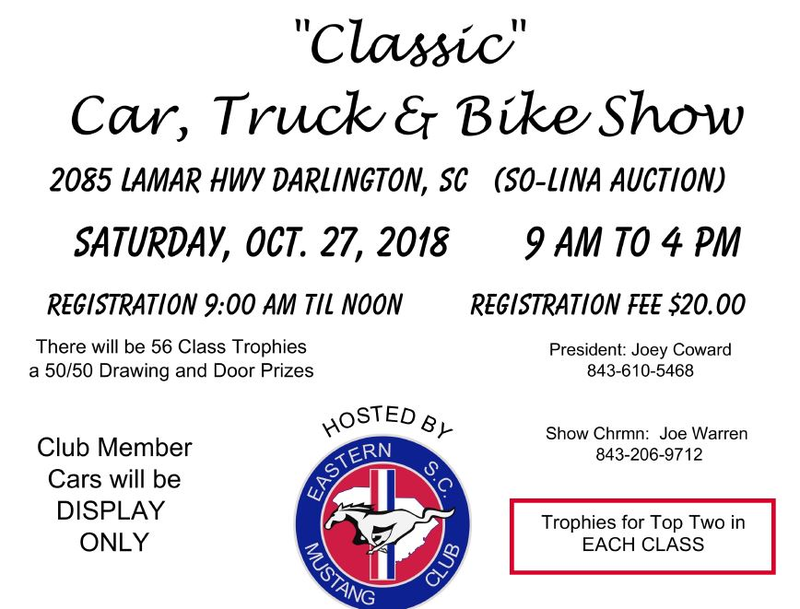 For information, please call 843-398-0060. 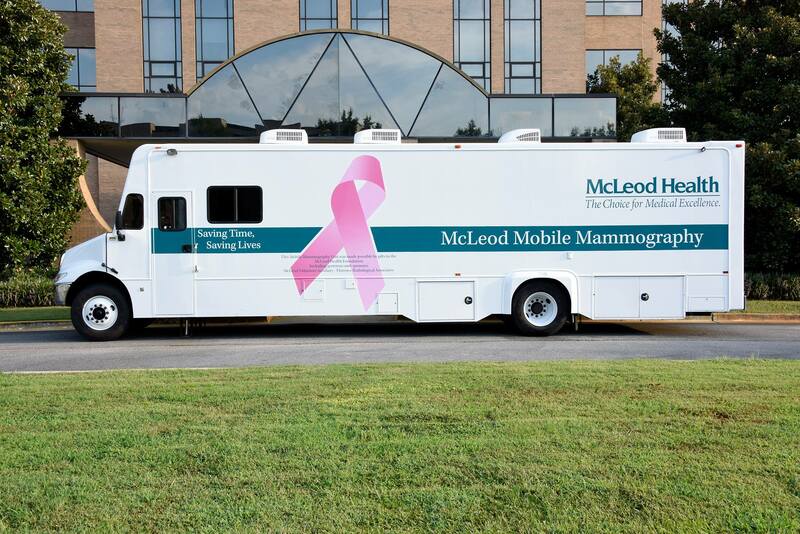 The McLeod Mobile 3D Mammography Unit will be visiting First Reliance Bank (2170 West Palmetto Street, Florence) on Wednesday, August 29 from 9:00 a.m. to 4:00 p.m. Appointments are still available. Schedule your mammogram by calling McLeod Reservations and Scheduling at (843) 777-2095. 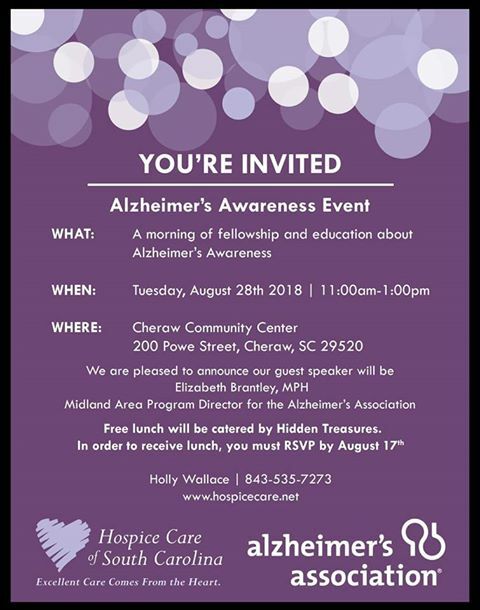 You’re invited to attend Hospice Care of SC’s Alzheimer’s Event at the Cheraw Community Center. 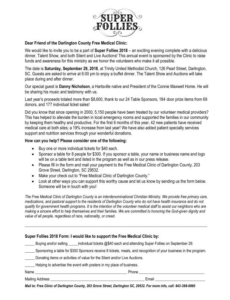 RSVP by August 17th to receive free lunch. 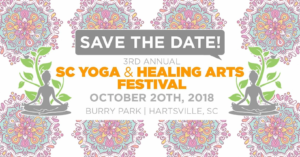 For more information please call Holly Wallace at 843-535-7273. 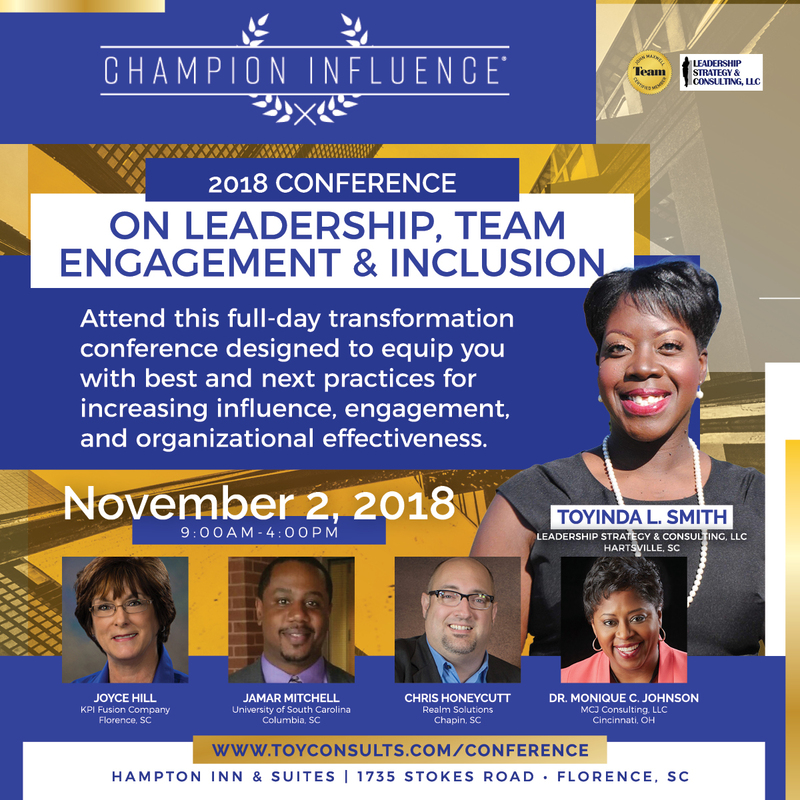 Join Toyinda Smith and guests for Champion Influence. This is a full-day workshop to increase organizational effectiveness. 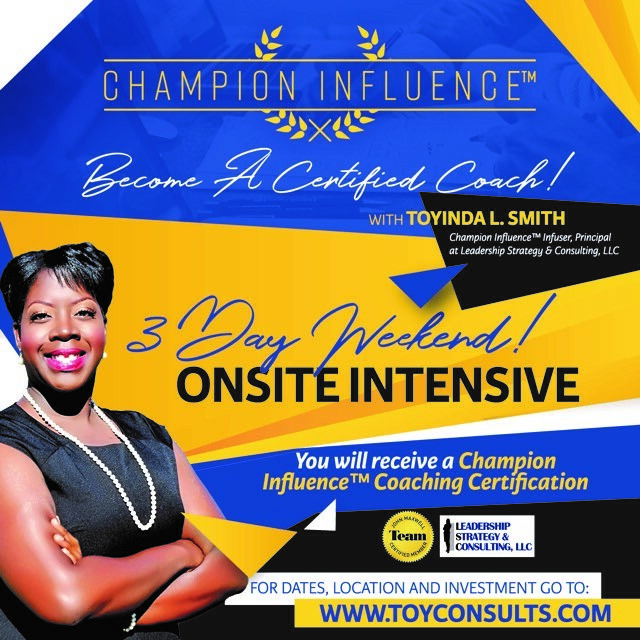 Visit www.toyconsults.com/conference for more information. 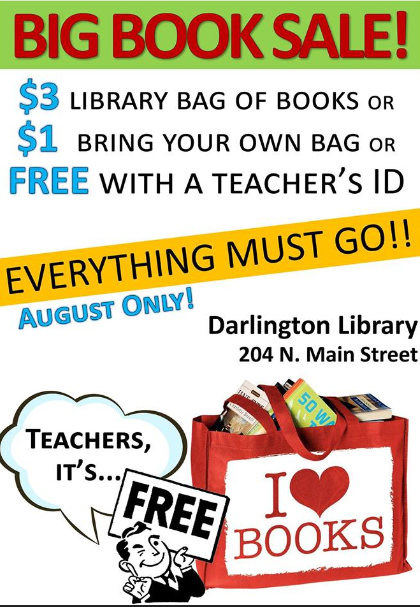 Darlington County Library System as a huge Book Sale going on right now! Bags of books range from free-$3. Florence, SC – The Pee Dee Speech & Hearing Center (PDSH) is celebrating the 50th anniversary of its founding in 1968. In celebration of its service, PDSH will host a fundraiser at Seminar Brewing on September 13, 2018 from 6:30-8:30. 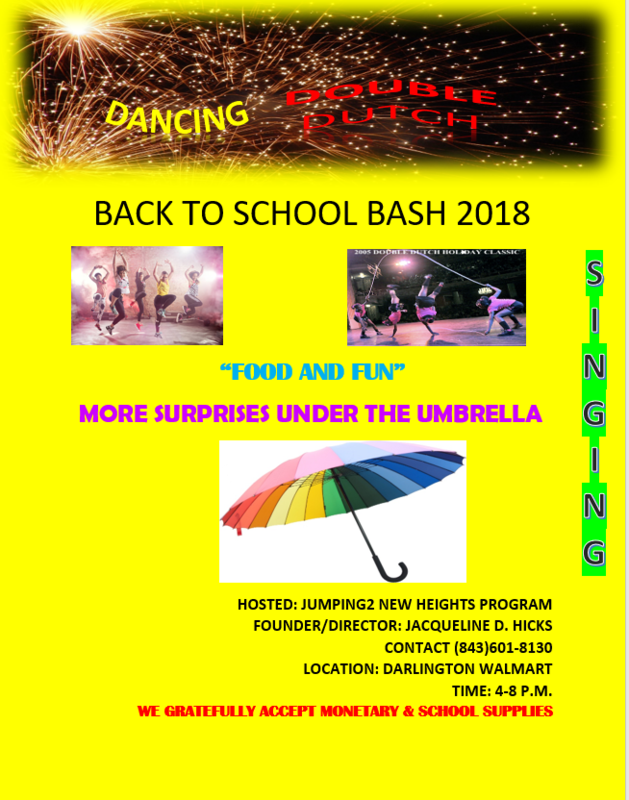 The event will feature food, drinks, games, and a ½&½ raffle, with music provided by Felonious Funk (featuring former members of the Woodys). The Center staff and board members invite the public to come share our celebration of 50 years of service to the community, while looking forward to continuing to serve the Pee Dee. Tickets to the event will be available for purchase at the Center, and through Eventbrite and the Center’s Facebook page. Corporate and business sponsorships are also available. In the Fall of 1968, with the help of a group of notable community leaders and many local businesses, Pee Dee Speech & Hearing Center opened its doors to serve the community. First located on McQueen Street, the Center later moved to its current location at 153 E. NB Baroody Street. 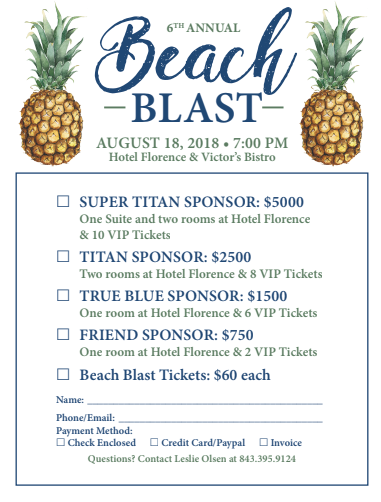 Of particular note, the current Center’s building was funded in part by the talents of famed entertainer Bob Hope, who came to Florence and performed to help raise money for the building. From the early days of the Center, the mission of the Center has been to provide the latest state-of-the-art speech therapy and audiology treatment and diagnostics to the Pee Dee region of South Carolina. Today, the Center is visited over 5000 times a year by those needing help. From newborns to the eldest in the community, the Pee Dee Speech & Hearing Center continues with great pride and passion to help improve the quality of life for those who seek assistance. 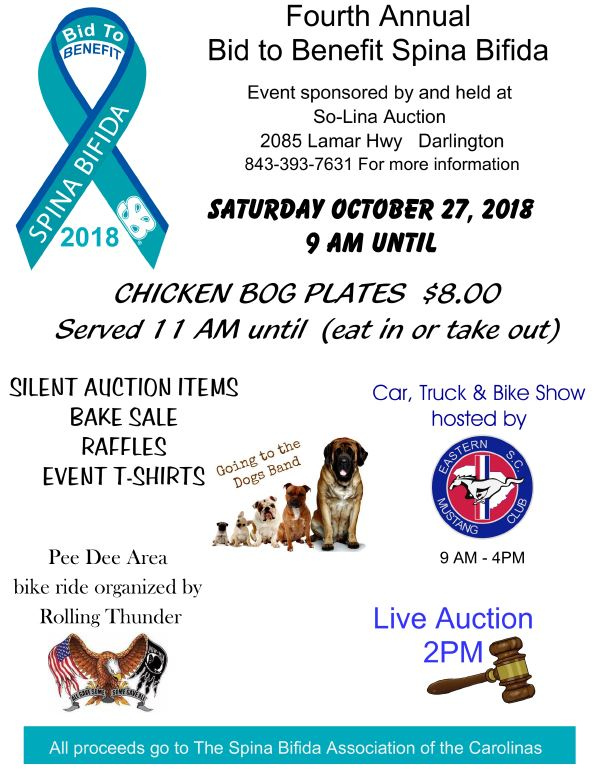 The Pee Dee Speech & Hearing Center, celebrating its 50th anniversary in 2018, is a non-profit provider of speech-language and hearing services for people of all ages and social strata. 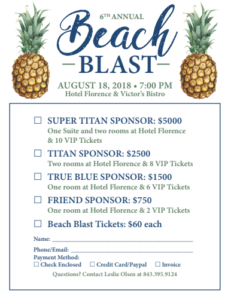 Established by a group of community leaders in 1968, it was their desire to have a service to help all people in the Florence area who have hearing problems or speech problems regardless of their ability to pay. 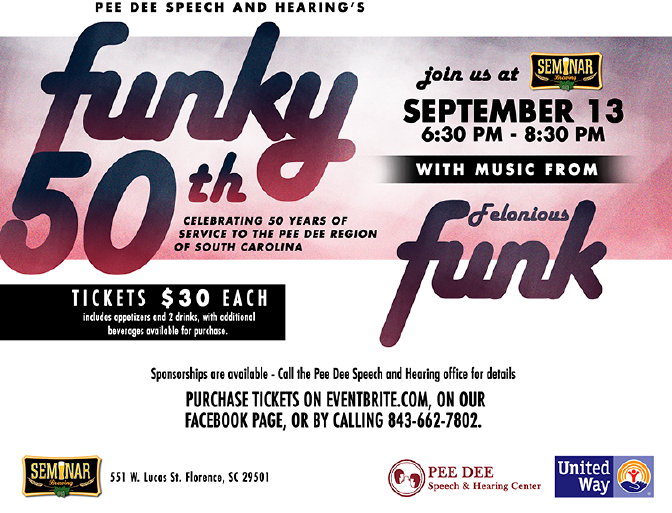 For more information, please visit www.peedeespeechandhearing.com or contact Dr. Dennis Burrows at 843-662-7802. 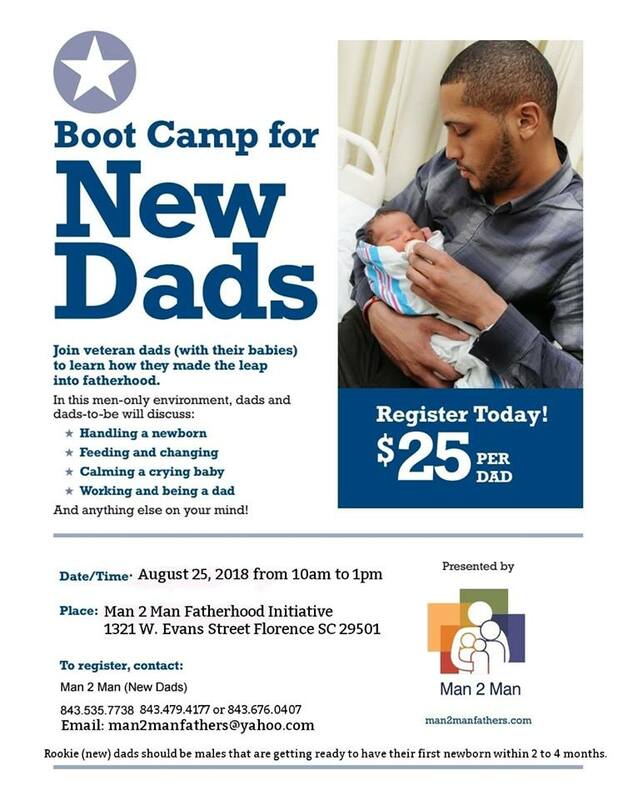 Join Man2Man for a New Dads Boot Camp- only $25! 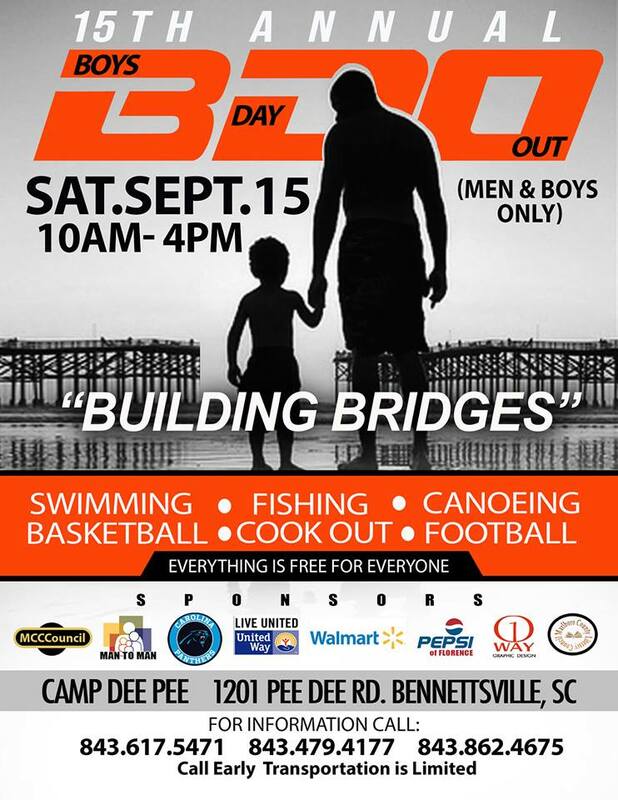 Join Man2Man for Boys Day Out on Saturday, September 15th at Camp Pee Dee in Bennettsville. Classes begin on Monday, August 13th. The September Shred will take place on September 21 at Bethea Retirement Community. Shur Shred is partnering with Bethea to provide shredding services for the general public. You are invited to bring any documents you want shredded, but no businesses please. 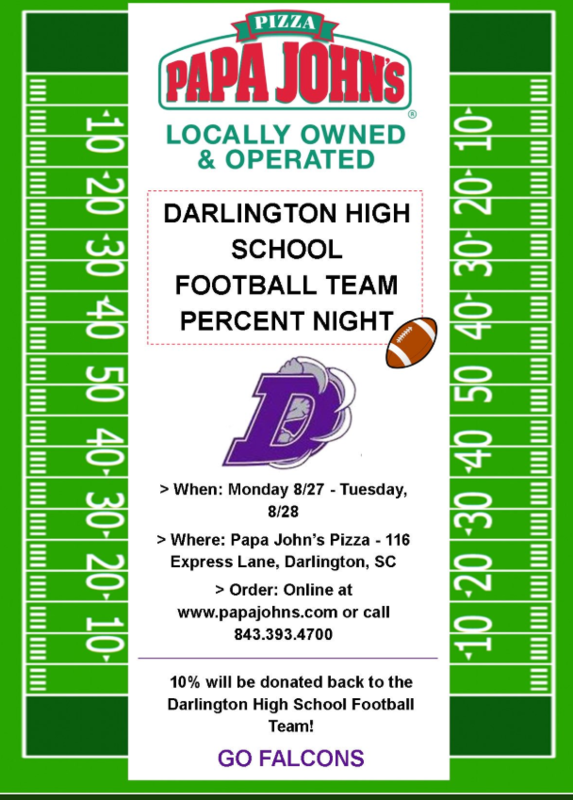 Support Papa Johns and the Darlington High School Falcons with percent nights August 27-28. 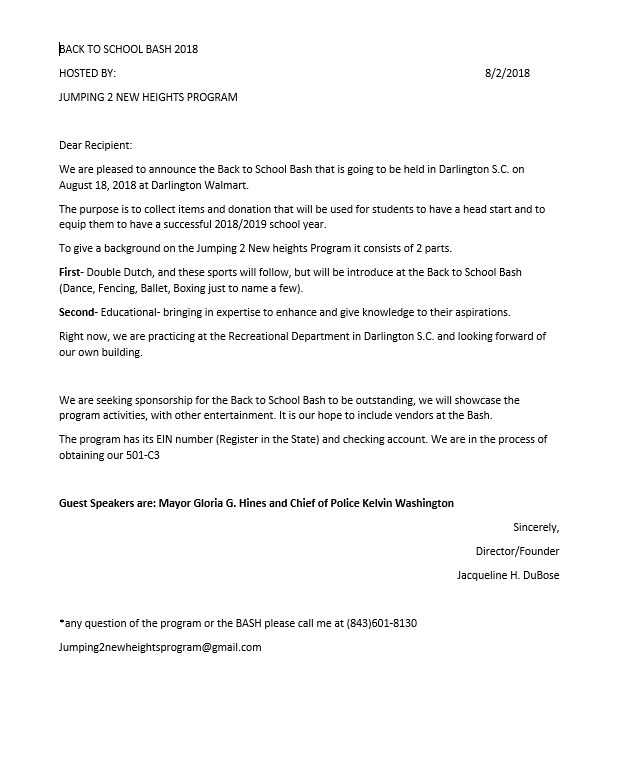 Ten percent will be donated back to the Darlington High School Football Team. Go Falcons!